This is a study painted after the work of an amazing 19th century painter George Inness. I was attracted to the glowing quality of his original and wanted to capture that feeling of passing twilight in the study of my own. Also of interest were the contrasting greens and the small luminous pond in the middle distance. 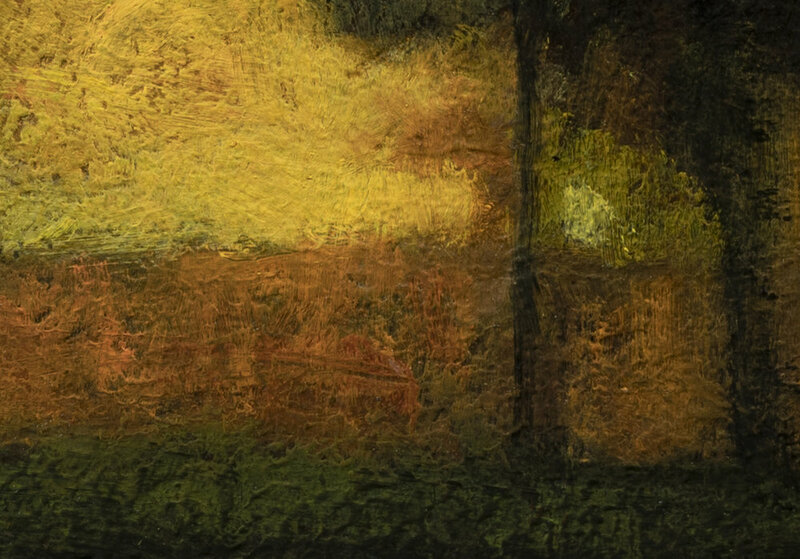 Doing studies after the great Masters of Tonalism is a major part of my practice as a painter. I spend just as much time, care and consideration on these studies as I do in the creation of my own original paintings. I am very happy to do this work to help promote Tonalism to a modern audience. While this painting is small, it benefits from close examination of the brushwork and exudes a luminous quality that is irresistible. Note that there is a enhanced surface texture to this painting and I have provided zoomed in views of this work on my blog and also in my store. My studies after the past Masters are some of the most popular blog posts on my website and also on my YouTube channel. For this reason I am now making them available for purchase in my store. Shipping is included in the price.